The increasing break-ins by Israeli settler gangs at al-Aqsa Mosque—the third holiest site in Islam—is a serious escalation, the Islamic Jihad Movement in Palestine said on Sunday. The group called for an urgent action in response to the Israeli violations and break-ins at such holy Islamic sites. 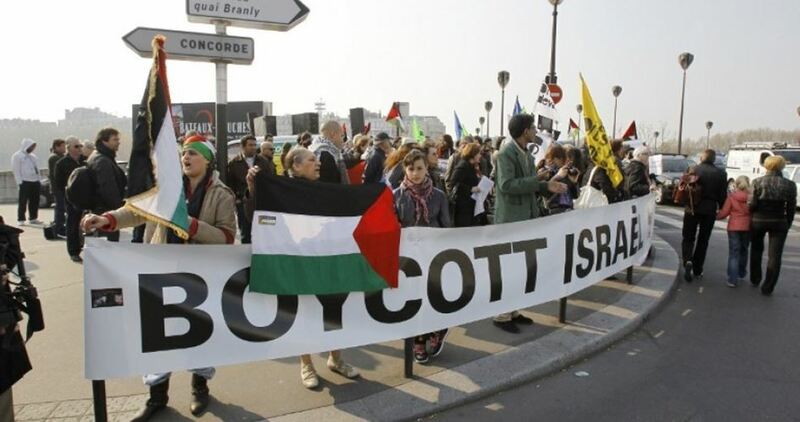 39 Jewish groups from across the world have defended the Boycott, Divestment and Sanctions (BDS) movement in an open letter released recently. “This conflation undermines both the Palestinian struggle for freedom, justice and equality and the global struggle against anti-Semitism. It also serves to shield Israel from being held accountable to universal standards of human rights and international law,” the letter asserts further. The organizations that signed the letter include Academia4equality (Israel), Boycott from Within (Israeli citizens for BDS), Coalition of Women for Peace (Israel), Collectif Judéo Arabe et Citoyen pour la Palestine (France), Dayenu: New Zealand Jews Against Occupation (New Zealand), Een Ander Joods Geluid (A Different Jewish Voice) (The Netherlands), Een Andere Joodse Stem – Another Jewish Voice (Flanders, Belgium), European Jews for a Just Peace, and Free Speech on Israel (UK). Palestinian Authority (PA) security forces on Saturday evening prevented the Palestinian citizens taking part in a demonstration against PA sanctions on Gaza from reaching the headquarters of the Palestine Liberation Organization (PLO) in Ramallah. 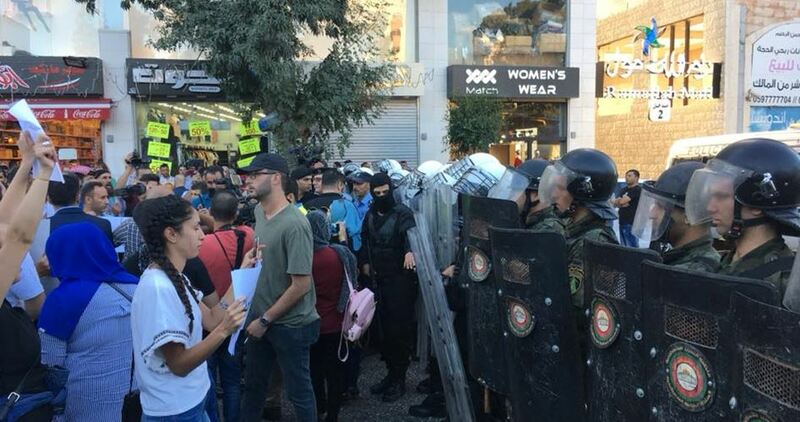 Large numbers of special police forces and masked officers were deployed in the area to block the road leading to the PLO headquarters, eyewitnesses said. In response to calls by the Movement to Lift Sanctions on Gaza, dozens of Palestinians marched in Ramallah in protest at the punitive measures imposed by the PA government on blockaded Gaza. Human rights activist Esam Abdin said that deploying security forces to quell Ramallah’s peaceful demonstration is a violation of Palestinian law which also prohibits collective punishment like the one imposed by the PA government on the Gaza Strip. Movement to Lift Sanctions on Gaza said in a statement that this demonstration is part of a series of protests and campaigns aimed at showing support to the Palestinian people in Gaza and pressuring the PA to lift its sanctions. The PA government in April 2017 decided to wage a set of punitive measures against the Gaza Strip, including cutting 30%-50% of the salaries of PA employees, forcing thousands of them into early retirement, reducing power supplies to the coastal enclave, suspending medical referrals, and halting monthly payments to the families of Gaza prisoners held in Israeli jails. RAMALLAH, PALESTINOW.COM — Detainees and Ex-Detainees Affairs Commission on Sunday said that more Palestinian prisoners have joined prisoner Hasan Shouka, who has been on hunger strike for 50 days, to protest their administrative detention. According to lawyer Luay Okka, prisoners Islam Jawarish, Mahmoud Ayyad, and Issa Awad joined the hunger strike 18 days ago, while Anas Shadid and Omar Abu Shkheidem started their strike on Thursday, 19th July. Okka added that the prisoners are suffering from headaches, dizziness, and severe pains in the stomach and the joints. They also refuse to take food supplements or undergo medical examinations. Okka pointed out that the Israel Prison Service keeps pressuring the prisoners to force them to suspend their hunger strike. Mahmoud Ayyad, 30, was arrested on 5th March 2017, and he was previously arrested in 2005, 2009 and 2014, while Islam Jawarish, 29, was arrested on 2nd February 2017 and has had his administrative detention renewed three times. There are about 430 Palestinians held in Israeli jails without charge or trial, including two minors and member of the Palestinian Legislative Council Khaleda Jarrar. Egypt on Saturday said a new Israeli law giving Jews the exclusive right to self-determination in the country undermined the chances for peace in the Middle East and the right of Palestinian refugees to return to their homes. The law, which was passed on Thursday, has drawn rebuke from the European Union and was denounced by the Palestinian Authority and Arab citizens of Israel as racist legislation. It said the law would also have a potential impact on the right of Palestinians displaced from their homes in 1948 when Israel was founded, and their descendants, to return to their homes under United Nations resolutions. Egypt in 1979 became the first Arab country to forge a peace treaty with Israel under the US-sponsored Camp David accord that provided for the Jewish state to withdraw from the Sinai Peninsula. But relations between two countries remained lukewarm, with Egypt demanding that Israel quit other lands it occupied in the 1967 Middle East war, including the Syrian Golan Heights, the West Bank and Gaza Strip and Arab East Jerusalem. On Friday, Egypt’s al-Azhar Mosque, the most prestigious Sunni Muslim institution, denounced the Israeli law calling it “a step that reflects repugnant racism”. Israel will reopen Gaza’s main commercial crossing and expand its fishing zone on Tuesday if a lull in cross-border tensions holds after a truce with Hamas, the Israeli defence minister said. Israel shut the Kerem Shalom border terminal and reduced the fishing zone to 11 km (6 miles) from 17 km (9 miles) on July 9 in response to fire-starting kites and helium balloons flown over by Palestinians as part of weeks of border protests. Hostilities escalated last week, with Palestinian gunfire killing an Israeli soldier and Israel’s military killing three Hamas fighters and a fourth Palestinian. The violence subsided on Saturday after Egypt and the United Nations mediated a truce. “We saw, yesterday, what might have been the calmest day since March 30,” Defence Minister Avigdor Lieberman told reporters on Sunday. In weekly Gaza protests since then, at least 140 Palestinians have been killed by the Israeli army in what it called border protection. Kerem Shalom is the main export-import conduit for the 2 million Palestinians of Gaza, which also borders Egypt. During the terminal’s closure, humanitarian aid was still allowed through Lieberman said traffic slowed to about 140 trucks a day from some 1,000 to 1,100 trucks per day. Senior Israeli Military officials said that they do not believe Hamas was behind the death of an Israeli soldier, who was shot with sniper fire from Gaza Friday, and added that the person who shot the soldier acted without Hamas’s approval. Israel believes that Hamas did not approve the shooting of the soldier, and had no knowledge of the attack, especially since senior political leaders of the movement, including its Political Bureau Chief Ismael Haniyya, were present in the protest areas. It said that senior political leaders of the movement would not put themselves in such risks by being exposed near the firing zone if they had any knowledge about the use of live fire by the Palestinians. They believe that the attack was carried out by a party, not loyal to Hamas, and does not follow its directives. The soldier, who was killed by sniper fire from Gaza, was later identified as Staff Sgt. Aviv Levi; he is the first soldier to be killed by Palestinian fire since Israel’s offensive and major deadly assault in Gaza in 2014. It is believed that the Levi was shot with a “Steyr HS .50” long range sniper rifle, especially since the bullet penetrated his military vest and killed him. It is worth mentioning that Israeli soldiers killed, on the same day, four Palestinians and injured 120 others, including 50 who were rushed to hospitals in the coastal region. The army also dropped dozens of missiles into Palestinian areas in several parts of the coastal region, before an indirect ceasefire understanding was reached. On Thursday, July 19, 2018, an Israeli army drone dropped a missile at Palestinians, east of Rafah, in the southern part of the Gaza Strip, killing one, identified as Abdul-Karim Radwan, 22, and wounding three others. It is worth mentioning that the Israeli army killed 146 Palestinians protesters, including 17 children, two medics and two journalists, and wounded more than 16496 others, since March 30th, 2018. 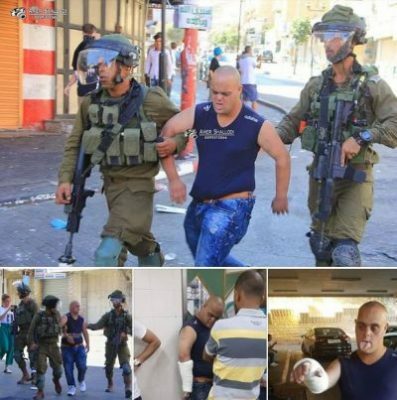 Israeli soldiers abducted, on Saturday morning, a Palestinian man with Down Syndrome, and repeatedly beat him until breaking his wrist, in Hebron city, in the southern part of the occupied West Bank. 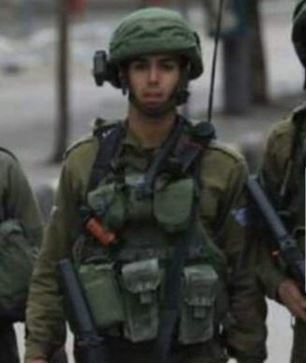 Media sources in Hebron said the soldiers abducted Mahmoud Zayed in Bab az-Zawiya area, in the center of Hebron city. The wounded Palestinian man posed no threat to the soldiers, and was just walking in the Old City, when he was violently assaulted by them, local confirmed. Local photojournalist Amer Shallodi was one of the people who witnessed the assault and managed to take pictures of the soldiers detaining Zayed, before and after assaulting him and breaking his wrist. Israeli soldiers abducted, on Saturday at night, a driver who works for the Education Ministry in Qabatia town, south of the northern West Bank city of Jenin, after attacking him, and breaking one of his ribs, in al-Khan al-Ahmar near occupied Jerusalem. 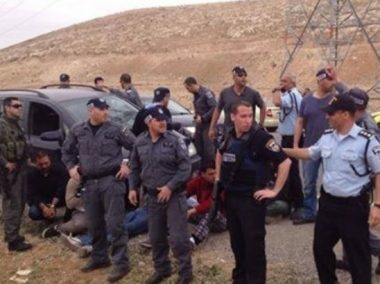 Mohammad Zakarna, the head of the Education Ministry in Qabatia, said the soldiers assaulted Sari Omar Kamil, 30, while attending a nonviolent activity in al-Khan al-Ahmar Palestinian community, facing Israeli demolition and displacement. Zakarna added that the soldiers stopped Kamil at the entrance of al-Khan al-Ahmar, after he tried to remove one of the police barriers, and frequently assaulted him, in addition to using their tasers on him. Kamil’s brother said the soldiers took him to Ofer detention center, despite his need to urgent medical attention, especially since the soldiers broke one of his ribs. It is worth mentioning that the soldiers installed barriers, in addition to placing sand hills and rocks, blocking the entry of solidarity activist into al-Khan al-Ahmar, which is still facing the threat of demolition and displacement. 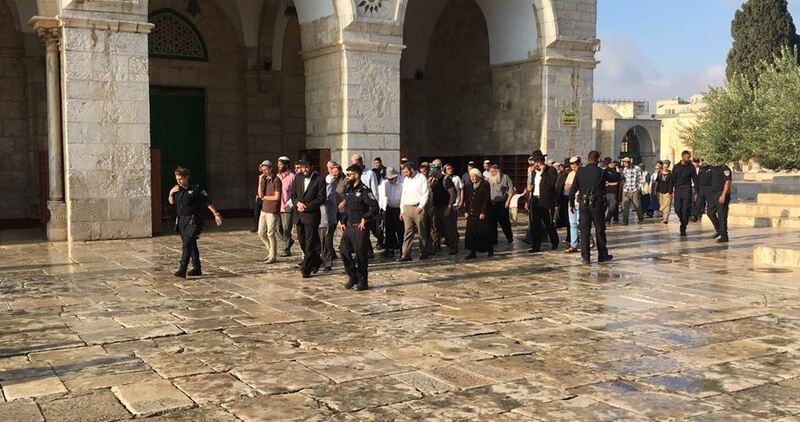 More than 1000 Israeli settlers in consecutive groups on Sunday morning stormed the courtyards of Al-Aqsa Mosque, under heavy protection by the Israeli Occupation forces, entering it from the Magharba Gate. Local sources in Jerusalem reported that large groups of settlers surrounded the courtyard of Al-Buraq Wall (the western wall of the Al-Aqsa Mosque) for hours and went to the Al-Qataneen market in Al-Wad Street, which ended with Al-Aqsa Mosque and performed prayers, From this side with strict security of the occupation forces. 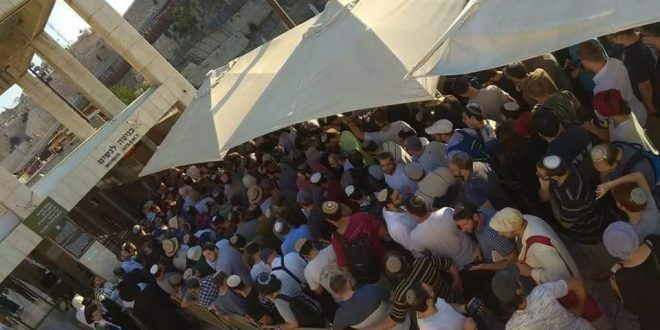 They pointed to several attempts by settlers yesterday to break into the al-Aqsa from different gates because of the closure of the Magharba gate on Friday and Saturday, while a group of settlers staged prayers in the Bab al-Rahma Islamic Cemetery.